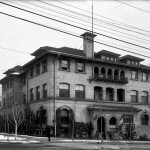 This historic hotel is believed to be haunted by the apparition of a moaning woman, who has been heard in the elevator and in the main hallways of the building. Staff and guests also report that the elevator will move from floor to floor by itself. Other reports of ghostly activity include the sounds of children running through the hallways, the strange aroma of perfume and sightings of a tall dark man standing in doorways, who vanishes suddenly when approached. The floors under the carpet is still the old wooden floors. Every night in room 212 I here the floor creak with footsteps. Plus one night my electrical cord was unplugged that had my cellphone. The locals told my wife and I a story about a handful of Mormons who went door to door at this hotel. They approached a room and when the knocked, they were shot through the door by a deranged gunman. The gunman then committed suicide.When anyone knocks on this door, they say they can hear a gunshot and screaming. I asked the manager about this and he verified this story. That’s pretty scary.